There are two big benefits for salons that sell more gift cards; new clients and additional dollars spent. So why aren’t you selling more gift cards? 41% of customers trying a business for the first time do so because they received a gift card – 4 out of every 10 new customers! What it boils down to is this: Salons that sell more gift cards should also have (a) more new clients, (b) more first-time clients who become returning clients, and (c) clients who spend more than the average ticket in your salon or spa. As they say, “What gets measured, gets done.” Goals must be specific and measurable, whether your metrics of choice are in numbers, percentages or dollars. See the list below for some ideas about what kinds of goals you should set. If this is your first foray into salon gift card sales goal-setting and tracking, keep it simple and focus on a few key numbers, such as staff participation, new clients acquired and overall revenue generated from gift card sales. Track the results of your salon’s gift card marketing investments. Stop telling your clients that you have gift cards. Most salons promote gift cards as though they believe customers don’t know they’re available. So they continually remind customers that they sell them and put displays by the cash register, graphics on their websites and mention it in email newsletters. I’m going to let you in on a little secret: Consumers expect everyone they do business with to sell gift cards. Your clients know you have gift cards. Therefore, if they aren’t buying your gift cards, it’s not because they don’t know you have them! To sell more gift cards, you don’t need to alert your clients to their existence; rather, you need to persuade them to buy them. They need to be convinced that your salon’s gift card is a thoughtful and appropriate present for the person they’re buying for. They need to know who to give them to. They need to know that you’re grateful for their referrals – whether those new clients come strictly via word of mouth or because they received a gift card. They need to feel as good about giving your gift cards to their co-workers, friends and loved ones as they feel when they go out and spend hours shopping for a perfect gift. The four life events and occasions that generate the most gift card sales overall include Christmas, birthdays, Mother’s Day and graduation. Create marketing campaigns to promote sales of salon gift cards that speak to these gift-card-sales-generating occasions and invest more in gift card marketing efforts during these key seasons. If your salon doesn’t have loyalty rewards or a loyalty program, you might create a birthday club where clients receive a gift card on their birthday or a special buy one-get one gift card offer where one card will be given away to a friend, co-worker or family member (e.g., to help you attract new clients to your salon). By the way, don’t worry that you are cannibalizing sales by selling gift cards to your own clients, even if you are extending a special offer. Remember that when redeeming gift cards, people usually spend more than the card’s value and may actually spend more than they would normally, because the money is not all coming out of their wallet or bank account at the same time! Besides selling gift cards to your clients to give away to others, think about how you can leapfrog over your ideal client type and promote salon gift cards to the husbands, boyfriends, moms, dads, sons, daughters, co-workers, friends and others who are buying gifts for the people represented in your target markets. 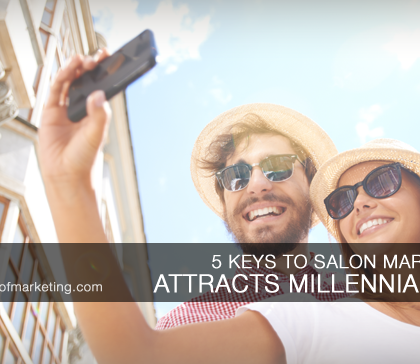 In other words, if you want to sell more salon gift cards (and you know you do!) you can’t merely promote gift cards to your own clients. You need to find ways to interact with gift-givers on social networks, email, partner marketing, advertising and other marketing avenues in order to sell gift cards to the people who buy presents for the clients you want most! 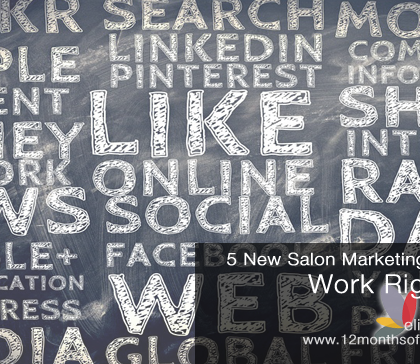 Written just for Independent Beauty Professionals, Making the Cut has hundreds of low-cost and no-cost marketing ideas which can help booth renters, salon suite owners, salon owners and salon managers engage, motivate and retain more clients in 2015! These are fantastic “ingredients” Elizabeth! I particularly liked #3. Strategy, strategy, strategy!